This Hands-on Lab assumes you have basic knowledge of ASP.NET MVC and ASP.NET MVC 4 filters. If you have not used ASP.NET MVC 4 filters before, we recommend you to go over ASP.NET MVC Custom Action Filters Hands-on Lab. All sample code and snippets are included in the Web Camps Training Kit, available from at Microsoft-Web/WebCampTrainingKit Releases. The project specific to this lab is available at ASP.NET MVC 4 Dependency Injection. In Object Oriented Programming paradigm, objects work together in a collaboration model where there are contributors and consumers. Naturally, this communication model generates dependencies between objects and components, becoming difficult to manage when complexity increases. You have probably heard about the Factory Pattern and the separation between the interface and the implementation using services, where the client objects are often responsible for service location. The Dependency Injection pattern is a particular implementation of Inversion of Control. Inversion of Control (IoC) means that objects do not create other objects on which they rely to do their work. Instead, they get the objects that they need from an outside source (for example, an xml configuration file). At a high level, the goal of Dependency Injection is that a client class (e.g. the golfer) needs something that satisfies an interface (e.g. IClub). It doesn't care what the concrete type is (e.g. WoodClub, IronClub, WedgeClub or PutterClub), it wants someone else to handle that (e.g. a good caddy). The Dependency Resolver in ASP.NET MVC can allow you to register your dependency logic somewhere else (e.g. a container or a bag of clubs). Dependency Injection is sometimes compared with Abstract Factory Design Pattern, but there is a slight difference between both approaches. DI has a Framework working behind to solve dependencies by calling the factories and the registered services. Now that you understand the Dependency Injection Pattern, you will learn throughout this lab how to apply it in ASP.NET MVC 4. You will start using Dependency Injection in the Controllers to include a database access service. Next, you will apply Dependency Injection to the Views to consume a service and show information. Finally, you will extend the DI to ASP.NET MVC 4 Filters, injecting a custom action filter in the solution. This Lab is using Unity.Mvc3 NuGet Package for dependency resolution, but it is possible to adapt any Dependency Injection Framework to work with ASP.NET MVC 4. 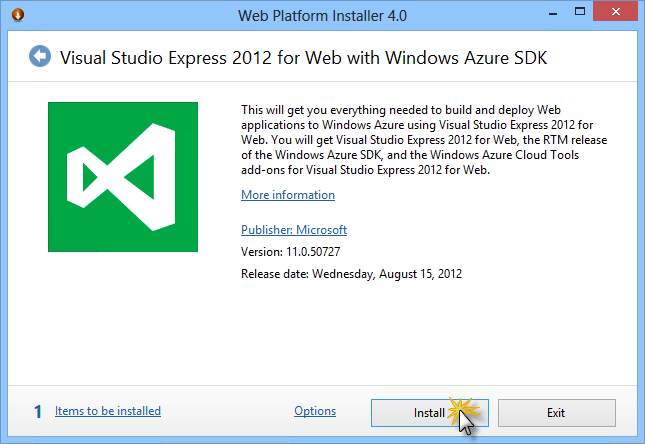 Microsoft Visual Studio Express 2012 for Web or superior (read Appendix A for instructions on how to install it). For convenience, much of the code you will be managing along this lab is available as Visual Studio code snippets. To install the code snippets run .\Source\Setup\CodeSnippets.vsi file. If you are not familiar with the Visual Studio Code Snippets, and want to learn how to use them, you can refer to the appendix from this document "Appendix B: Using Code Snippets". Estimated time to complete this lab: 30 minutes. In this exercise, you will learn how to use Dependency Injection in ASP.NET MVC Controllers by integrating Unity using a NuGet Package. For that reason, you will include services into your MvcMusicStore controllers to separate the logic from the data access. The services will create a new dependency in the controller constructor, which will be resolved using Dependency Injection with the help of Unity. This approach will show you how to generate less coupled applications, which are more flexible and easier to maintain and test. You will also learn how to integrate ASP.NET MVC with Unity. The MVC Music Store provided in the begin solution now includes a service that manages the Store Controller data named StoreService. Below you will find the Store Service implementation. Note that all the methods return Model entities. 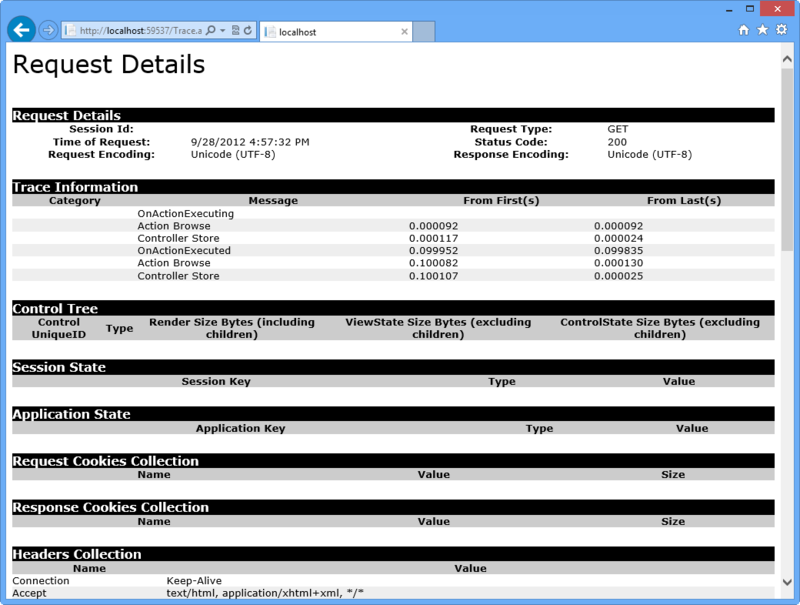 StoreController from the begin solution now consumes StoreService. All the data references were removed from StoreController, and now possible to modify the current data access provider without changing any method that consumes StoreService. You will find below that the StoreController implementation has a dependency with StoreService inside the class constructor. The dependency introduced in this exercise is related to Inversion of Control (IoC). The StoreController class constructor receives an IStoreService type parameter, which is essential to perform service calls from inside the class. 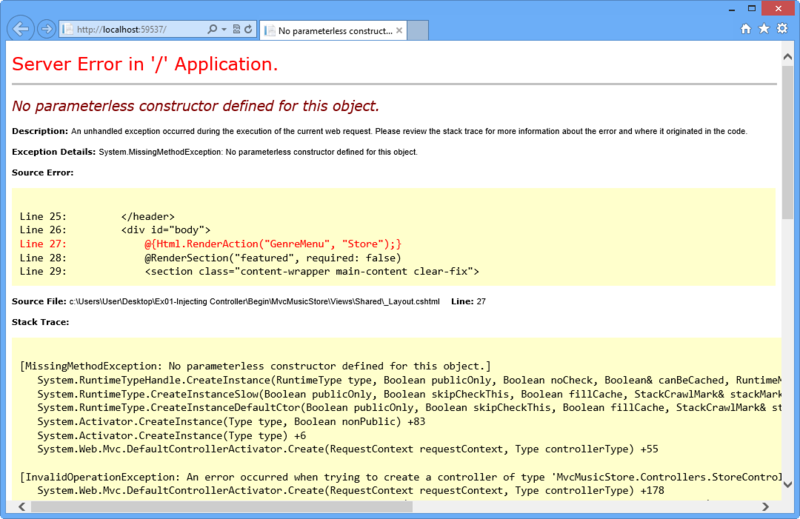 However, StoreController does not implement the default constructor (with no parameters) that any controller must have to work with ASP.NET MVC. To resolve the dependency, the controller has to be created by an abstract factory (a class that returns any object of the specified type). You will get an error when the class tries to create the StoreController without sending the service object, as there is no parameterless constructor declared. In this task, you will run the Begin application, which includes the service into the Store Controller that separates the data access from the application logic. Open the Begin solution located in Source\Ex01-Injecting Controller\Begin. You will need to download some missing NuGet packages before continue. To do this, click the Project menu and select Manage NuGet Packages. In the Manage NuGet Packages dialog, click Restore in order to download missing packages. Finally, build the solution by clicking Build | Build Solution. One of the advantages of using NuGet is that you don't have to ship all the libraries in your project, reducing the project size. With NuGet Power Tools, by specifying the package versions in the Packages.config file, you will be able to download all the required libraries the first time you run the project. This is why you will have to run these steps after you open an existing solution from this lab. In the following steps you will work on the Music Store Solution to inject the dependency this controller needs. In this task, you will include Unity.Mvc3 NuGet Package to the solution. Unity.Mvc3 package was designed for ASP.NET MVC 3, but it is fully compatible with ASP.NET MVC 4. Unity is a lightweight, extensible dependency injection container with optional support for instance and type interception. It is a general-purpose container for use in any type of .NET application. It provides all the common features found in dependency injection mechanisms including: object creation, abstraction of requirements by specifying dependencies at runtime and flexibility, by deferring the component configuration to the container. 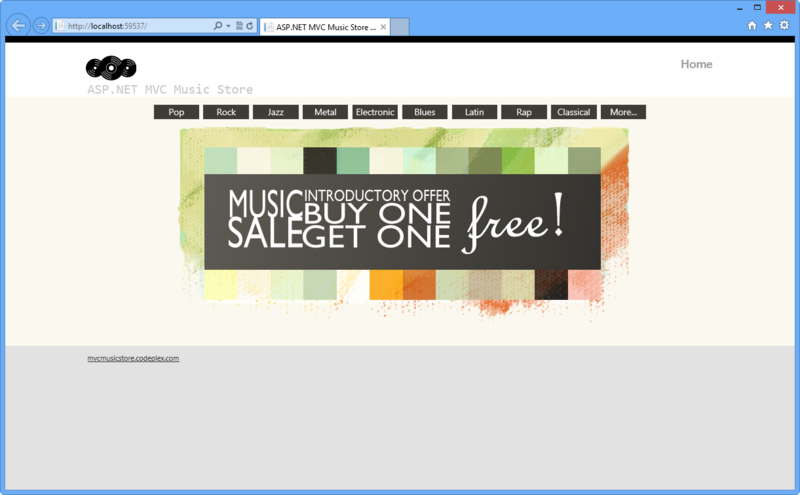 Install Unity.Mvc3 NuGet Package in the MvcMusicStore project. To do this, open the Package Manager Console from View | Other Windows. 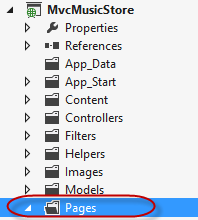 Once the Unity.Mvc3 package is installed, explore the files and folders it automatically adds in order to simplify Unity configuration. In this task, you will update the Application_Start method located in Global.asax.cs to call the Unity Bootstrapper initializer and then, update the Bootstrapper file registering the Service and Controller you will use for Dependency Injection. Now, you will hook up the Bootstrapper which is the file that initializes the Unity container and Dependency Resolver. To do this, open Global.asax.cs and add the following highlighted code within the Application_Start method. Include the following namespaces: MvcMusicStore.Services and MusicStore.Controllers. 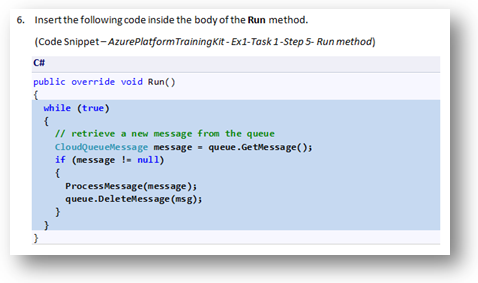 Replace BuildUnityContainer method's content with the following code that registers Store Controller and Store Service. In this task, you will run the application to verify that it can now be loaded after including Unity. Press F5 to run the application, the application should now load without showing any error message. Browse to /Store. This will invoke StoreController, which is now created using Unity. In the following exercises you will learn how to extend the Dependency Injection scope to use it inside ASP.NET MVC Views and Action Filters. In this exercise, you will learn how to use Dependency Injection in a view with the new features of ASP.NET MVC 4 for Unity integration. In order to do that, you will call a custom service inside the Store Browse View, which will show a message and an image below. Then, you will integrate the project with Unity and create a custom dependency resolver to inject the dependencies. In this task, you will create a view that performs a service call to generate a new dependency. The service consists in a simple messaging service included in this solution. Open the Begin solution located in the Source\Ex02-Injecting View\Begin folder. Otherwise, you might continue using the End solution obtained by completing the previous exercise. If you opened the provided Begin solution, you will need to download some missing NuGet packages before continue. To do this, click the Project menu and select Manage NuGet Packages. For more information, see this article: http://docs.nuget.org/docs/workflows/using-nuget-without-committing-packages. Include the MessageService.cs and the IMessageService.cs classes located in the Source \Assets folder in /Services. To do this, right-click Services folder and select Add Existing Item. Browse to the files' location and include them. The IMessageService interface defines two properties implemented by the MessageService class. These properties -Message and ImageUrl- store the message and the URL of the image to be displayed. Create the folder /Pages in the project's root folder, and then add the existing class MyBasePage.cs from Source\Assets. The base page you will inherit from has the following structure. Open Browse.cshtml view from /Views/Store folder, and make it inherit from MyBasePage.cs. In the previous task, you injected a new dependency inside a view to perform a service call inside it. Now, you will resolve that dependency by implementing the ASP.NET MVC Dependency Injection interfaces IViewPageActivator and IDependencyResolver. You will include in the solution an implementation of IDependencyResolver that will deal with the service retrieval by using Unity. Then, you will include another custom implementation of IViewPageActivator interface that will solve the creation of the views. Since ASP.NET MVC 3, the implementation for Dependency Injection had simplified the interfaces to register services. IDependencyResolver and IViewPageActivator are part of ASP.NET MVC 3 features for Dependency Injection. - IDependencyResolver interface replaces the previous IMvcServiceLocator. Implementers of IDependencyResolver must return an instance of the service or a service collection. - IViewPageActivator interface provides more fine-grained control over how view pages are instantiated via dependency injection. 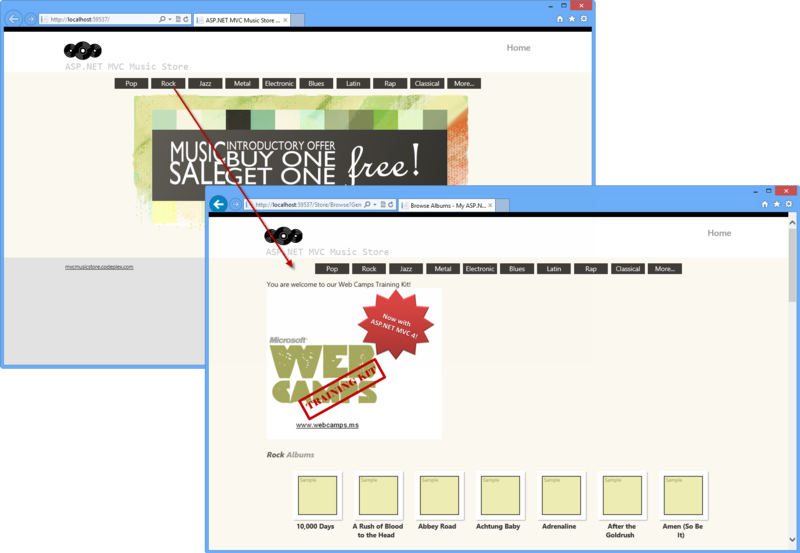 The classes that implement IViewPageActivator interface can create view instances using context information. Create the /Factories folder in the project's root folder. Include CustomViewPageActivator.cs to your solution from /Sources/Assets/ to Factories folder. To do that, right-click the /Factories folder, select Add | Existing Item and then select CustomViewPageActivator.cs. This class implements the IViewPageActivator interface to hold the Unity Container. CustomViewPageActivator is responsible for managing the creation of a view by using a Unity container. Include UnityDependencyResolver.cs file from /Sources/Assets to /Factories folder. To do that, right-click the /Factories folder, select Add | Existing Item and then select UnityDependencyResolver.cs file. UnityDependencyResolver class is a custom DependencyResolver for Unity. When a service cannot be found inside the Unity container, the base resolver is invocated. In the following task both implementations will be registered to let the model know the location of the services and the views. In this task, you will put all the previous things together to make Dependency Injection work. A Browse View that inherits from MyBaseClass and consumes MessageService. An intermediate class -MyBaseClass- that has dependency injection declared for the service interface. A service - MessageService - and its interface IMessageService. A custom dependency resolver for Unity - UnityDependencyResolver - that deals with service retrieval. A View Page activator - CustomViewPageActivator - that creates the page. To inject Browse View, you will now register the custom dependency resolver in the Unity container. Add a reference to MvcMusicStore.Factories namespace. ASP.NET MVC provides a default dependency resolver class. To work with custom dependency resolvers as the one we have created for unity, this resolver has to be replaced. In the previous Hands-On lab Custom Action Filters you have worked with filters customization and injection. In this exercise, you will learn how to inject filters with Dependency Injection by using the Unity container. 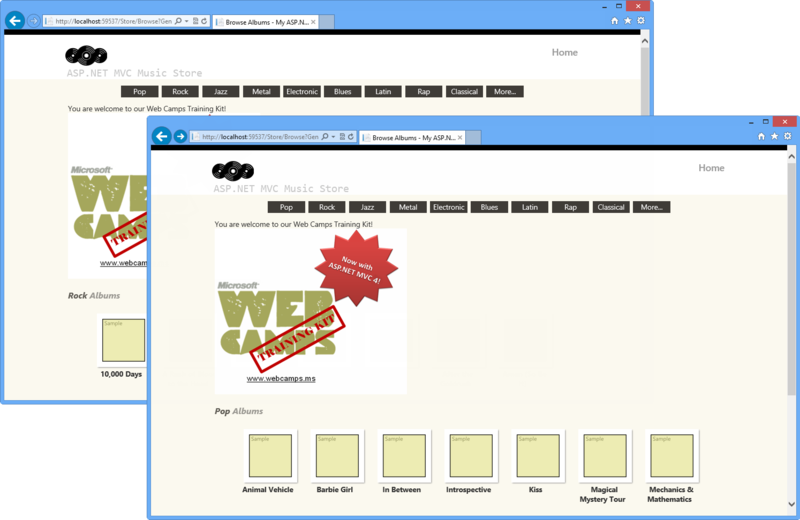 To do that, you will add to the Music Store solution a custom action filter that will trace the activity of the site. Open the Begin solution located in the Source\Ex03 - Injecting Action Filter\Begin folder. Otherwise, you might continue using the End solution obtained by completing the previous exercise. Include TraceActionFilter.cs file from /Sources/Assets to /Filters folder. This custom action filter performs ASP.NET tracing. You can check "ASP.NET MVC 4 local and Dynamic Action Filters" Lab for more reference. Add the empty class FilterProvider.cs to the project in the folder /Filters. 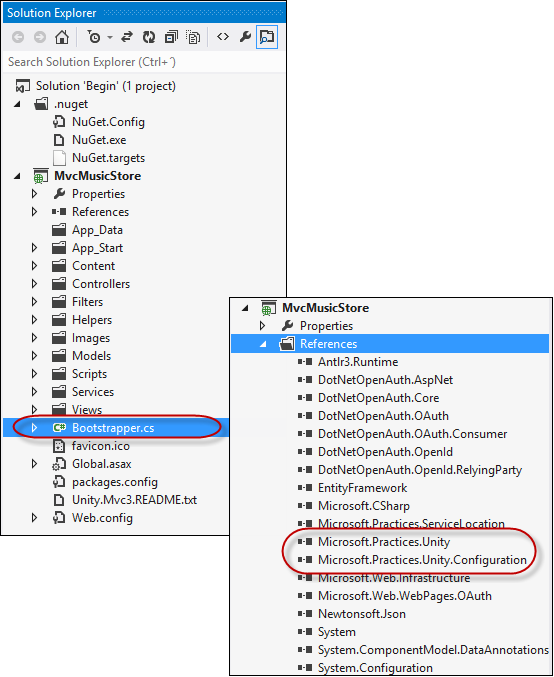 Add the System.Web.Mvc and Microsoft.Practices.Unity namespaces in FilterProvider.cs. Make the class inherit from IFilterProvider Interface. Add a IUnityContainer property in the FilterProvider class, and then create a class constructor to assign the container. The filter provider class constructor is not creating a new object inside. The container is passed as a parameter, and the dependency is solved by Unity. In the FilterProvider class, implement the method GetFilters from IFilterProvider interface. Open Web.config located in the project root and enable trace tracking at System.Web group. Open Bootstrapper.cs at project root. 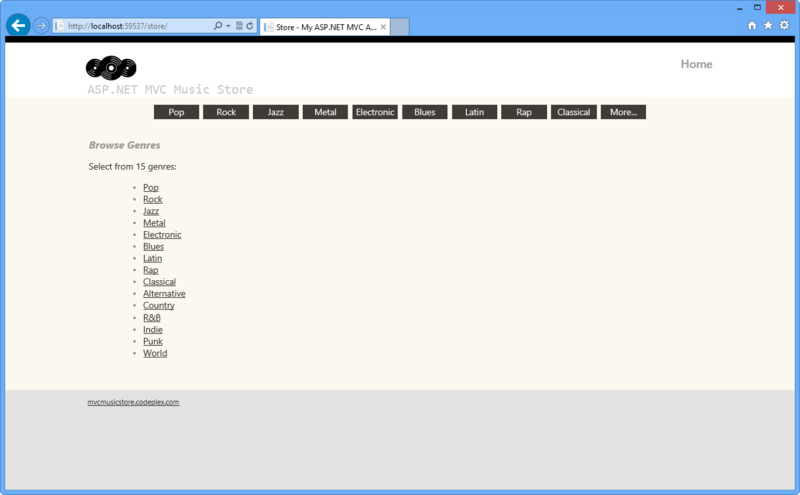 Add a reference to the MvcMusicStore.Filters namespace. Select the BuildUnityContainer method and register the filter in the Unity Container. You will have to register the filter provider as well as the action filter. Click Rock within the Genres Menu. You can browse to more genres if you want to. 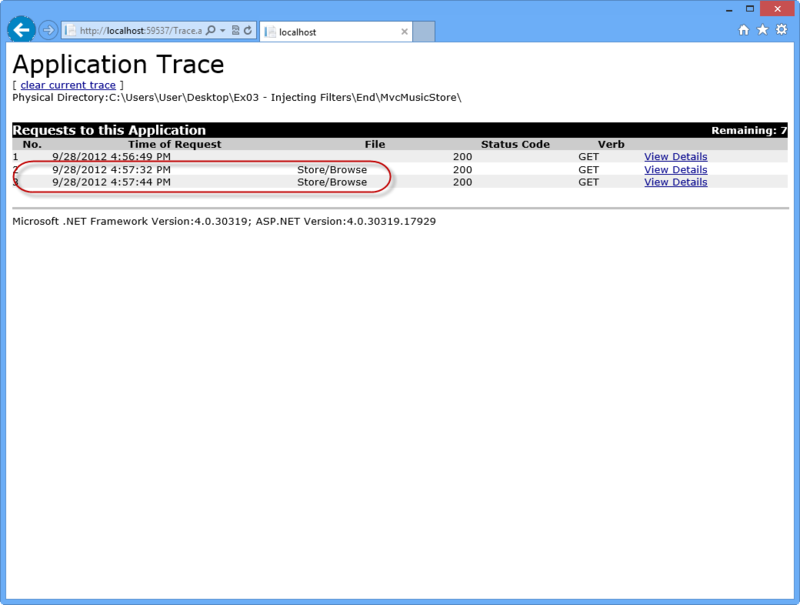 Browse to /Trace.axd to see the Application Trace page, and then click View Details. By completing this Hands-On Lab you have learned how to use Dependency Injection in ASP.NET MVC 4 by integrating Unity using a NuGet Package. To achieve that, you have used Dependency Injection inside controllers, views and action filters. 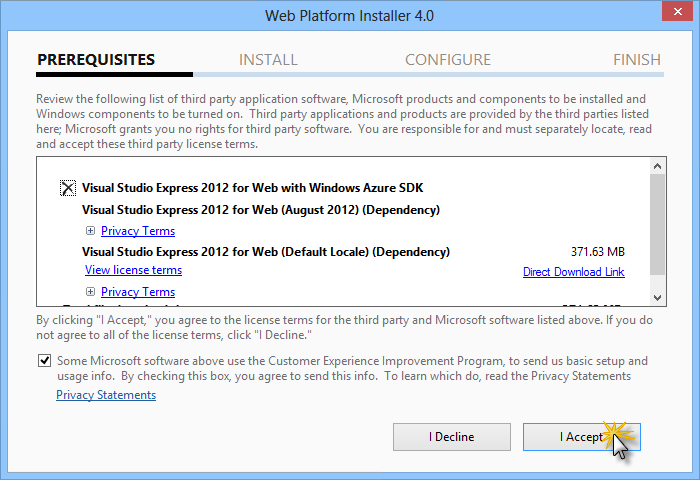 You can install Microsoft Visual Studio Express 2012 for Web or another "Express" version using the Microsoft Web Platform Installer. The following instructions guide you through the steps required to install Visual studio Express 2012 for Web using Microsoft Web Platform Installer. Go to https://go.microsoft.com/?linkid=9810169. Alternatively, if you already have installed Web Platform Installer, you can open it and search for the product "Visual Studio Express 2012 for Web with Windows Azure SDK". Click on Install Now. 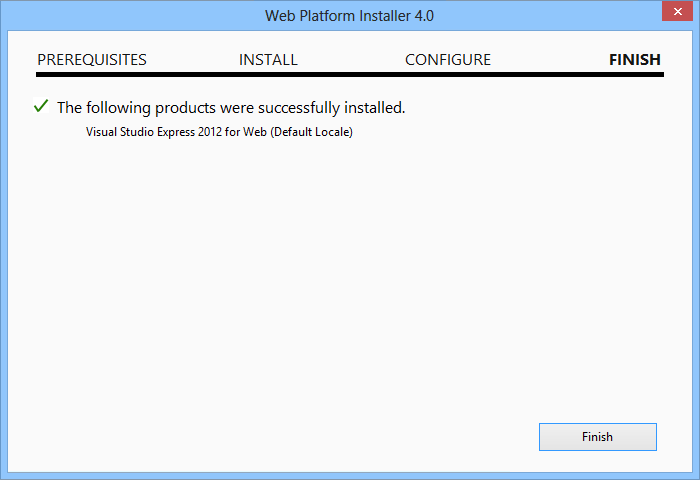 If you do not have Web Platform Installer you will be redirected to download and install it first. 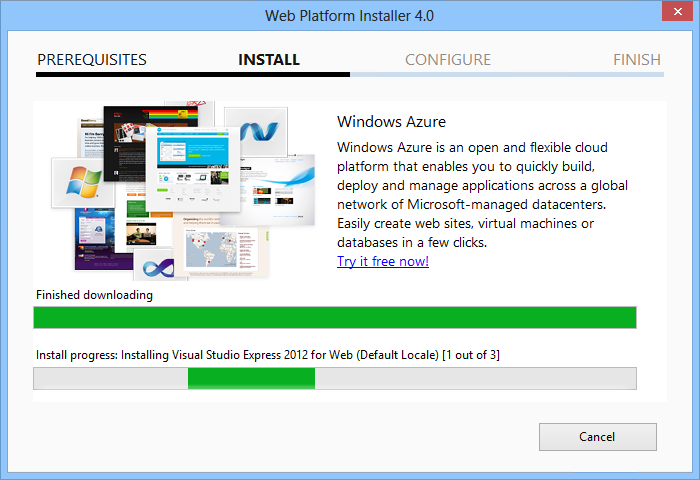 Once Web Platform Installer is open, click Install to start the setup. Read all the products' licenses and terms and click I Accept to continue. Wait until the downloading and installation process completes. Click Exit to close Web Platform Installer. To open Visual Studio Express for Web, go to the Start screen and start writing "VS Express", then click on the VS Express for Web tile. With code snippets, you have all the code you need at your fingertips. The lab document will tell you exactly when you can use them, as shown in the following figure. Place the cursor where you would like to insert the code. Start typing the snippet name (without spaces or hyphens). 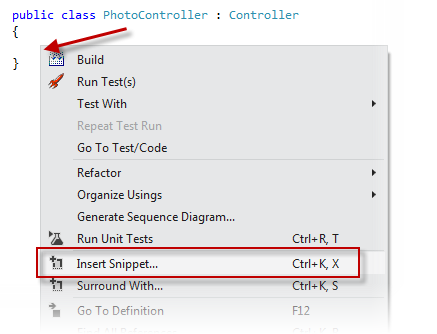 Watch as IntelliSense displays matching snippets' names. Select the correct snippet (or keep typing until the entire snippet's name is selected). Press the Tab key twice to insert the snippet at the cursor location. To add a code snippet using the mouse (C#, Visual Basic and XML) 1. Right-click where you want to insert the code snippet. Select Insert Snippet followed by My Code Snippets. Pick the relevant snippet from the list, by clicking on it.